GREATNESS THROUGH KNOWLEDGE, INTEGRITY AND INNOVATION. 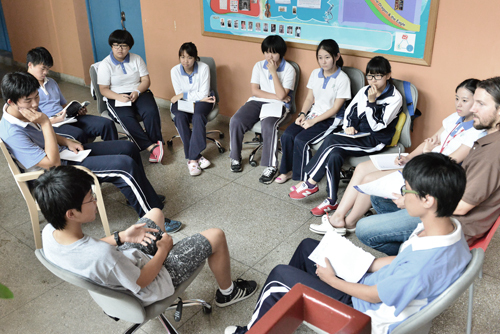 YCID is a cross-cultural education program within YuCai High School in Shenzhen, China that prepares Chinese students for fully active engagement and leadership in American universities and beyond. The	mission	of	YCID	is	to	help	all	students	to	develop	their	skills, knowledge,	character	and	well-being	to	thrive	at American universities	and	beyond	as	leaders	in	the	global community. To	meet	this	objective	we	employ	several pedagogical,	structural	and staffing	approaches	that	set	us	apart from	other	schools	in	China	that	serve	Chinese	students	aspiring to	attend	universities	outside of	China. 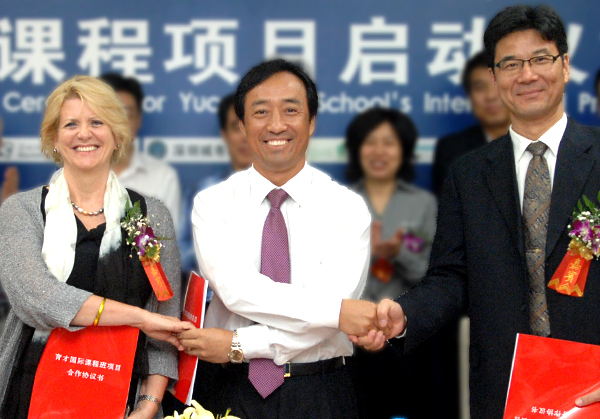 After several years of planning, with the full support of the Nanshan Education Bureau and YuCai Education Group, and in partnership with Shenzhen City College and American company, InterLangua LLC, YCID was launched at the start of the second semester in February of 2012 with an inaugural class of sophomores. The YCID program serves between 22-28 students at each grade level. Notable designers of the program include: Liu Gen Ping, head of Nanshan Education Bureau and renowned educational innovator in Shenzhen; Elisabeth Montgomery, PhD, who has a long record of successful educational programming in China; and Chris Young, Stanford Teacher Education Program MA Ed and Fulbright Distinguished Award in Teaching recipient. "Greatness through knowledge, integrity and innovation." A rigorous, college preparatory core curriculum rooted in the discussion based Shared Inquiry™ methods and content of the Great Books Foundation. Currently, we are the only designated partner of Great Books in China. Learn more in the Courses section. A 100% English environment in courses developed and taught by Great Books certified and US-certificated teachers emphasizing independent, critical thinking and comparative analysis of Western themes, values and ideas, multiple perspectives, and a balance of lecture with student-centered activities. Meet the team in the Staff section. Project-based learning in our Integrated Studies courses, and throughout our program, that leads to YCID students becoming effective collaborators and innovators of original products and ideas. Experiential, holistic, and service-learning values promoted in our 120-hour Action, Creativity, Training, Service (ACTS) requirement. A growing internship program with Chinese and US partners. Most of our students complete internships, summer study tours or educational enrichment programs within or outside of China. An advisory program that equips students with the ability to self-advocate, further develop emotional intelligence, and other practical and character-building skills that will empower them to healthily and effectively navigate college life and US culture. An annual “Dragon and Eagle Dialogue,” wherein a salient current issue is discussed in-depth amongst YCID students and American or other non-Chinese students. Learn more in the Activities section. Typical American holiday celebrations and a physical education course that expose students to these fundamental elements of American culture they will inevitably encounter while in the US. YCID incorporates experiential educational programs with a proven record of success in American education. We have incorporated Roots and Shoots Community Gardens which is Jane Goodall's international movement for food safety and conscious eating and in Fall of 2014 we will launch a high school STEM education program using tools and curriculum developed for FabLabs@School, at the Transformative Technologies Lab at Stanford University Graduate School of Education. Program designed and created by InterLangua.